This activity is aimed at visitors who want to learn more about our dolphins, in a guided tour in which an educational talk is held where participants can see and learn the characteristics of the dolphins very closely. From a specially designed platform, participants can access the dolphin habitat and be very close to them at a safe depth [0,90M] and at the same time fully protected. During the explanation the participants can learn how to teach the dolphins and try some exercise with them. 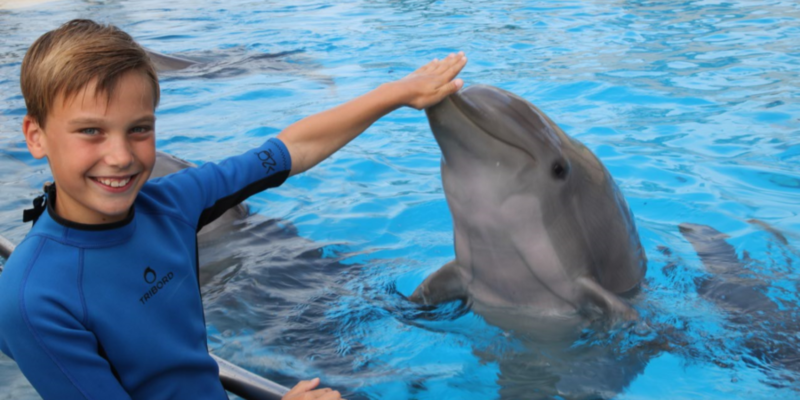 A member of the dolphinarium department will be responsible for receiving the participants, providing explanations within the dolphinarium facilities and accompanying the participants of this activity at all times. 1- When arriving at the park, participants should first go through the information point to make the payment and confirm the reservation. There will be an explanation of the rules and the authorization sheet. Once read they must be completed and signed. 2- They proceed to the entrance of the dolphinarium at least 30 minutes before the time of the activity. where they will be received by a caretaker guide. At this time, it is essential to present the signed authorization form and the purchase voucher. Without the two do not admit the entry to the activity. The guide will welcome the participants and will introduce the activity. 3- Participants have to shower and change in the facilities prepared at the meeting point. There are lockers and changing rooms for girls / boys in which they can leave their belongings. After showering, a neoprene provided by the dolphinarium will be put on. 4- Upon entering the operative area of ​​the dolphinarium, each participant will go through a foot bath that will contain water and a disinfectant for the feet (chlorhexidine). 5- The group will enter the submerged platform [0, 90 M] inside the dolphin habitat specially designed to bring the dolphins closer to the participants but at the same time fully protected. The trainers will approach the dolphins to be able to make an educative talk about morphology and characteristics very about them. 6- Once the talk is over, visitors will have the possibility of interacting with the dolphins by means of signs under instruction of the trainers. 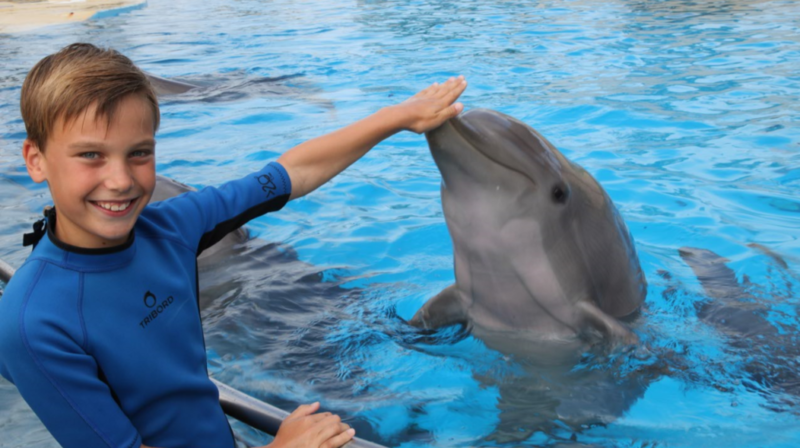 Each participant will have a moment of meeting, the opportunity to interact with the dolphins and have the opportunity briefly to touch a dolphin. 7- The group is dismissed, thanking them for their participation and contribution to our conservation and environmental protection foundation: Parques Reunidos Foundation. 8- At the end, the group of visitors is accompanied to the meeting area where each visitor would have to shower / change and collect their belongings. 6) Companions of the participants can observe from the area delimited in the bleachers always when they do not interfere with the activity. – Swim with dolphins is prohibited according to Spanish legislation, but Aquopolis allows you to make a unique and different experience with these animals. – Pre and post disinfection via shower / Special soap provided by the park [Included] The breach of these instructions or any other that could be given by those responsible for the Aquopolis, may suppose the immediate termination of the Interaction, without that termination of right to compensation or compensation in their favor. THE TICKETS FOR THE DOLPHIN ENCOUNTER CAN BE BOUGHT AT OUR WEBSITE, BUT YOU HAVE TO CALL US FOR BOOK THE ACTIVITY AT +34977 370258 OR SEND AND MAIL TO: reservascda@grpr.com AND WE CAND SEND THE CONFIRMATION. MINORS BETWEEN 7 AND 9 YEARS OLD (less tan 1,40m) MUST DO THE ACTIVITY WITH AN ADULT WHO SHOULD ALSO PAY.